Call me old-fashioned, but sometimes I like old-fashioned places. One place that does old-fashioned especially well is France. But I’m not the only one who feels that way; people come from around the world to visit the city, and bask in the à l’ancienne charm, which is sometimes derisively described as carte postale Paris. Like other cities, Paris is changing and isn’t a museum, per se, but there’s something about the city that attracts people like no other city in the world. Many visitors come specifically to eat. Which I know for a fact because I came for the same reason. The loss of bistros has been well-documented, but there’s been a resurgence of interest in bistros that has sprung up in New York, London, Tokyo, and of course – even Paris, where la cuisine française is having a renaissance, too. But at some places, it never left. One such place is Moissonnier, which is considered a bouchon lyonnais, sending out plates of hearty, copious French food in the style of the bouchons of Lyon. 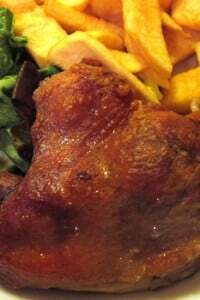 The restaurant is run by the husband and wife team of Philippe and Valérie Mayet. Chef Mayet has been called “the ambassador of the cuisine of the Jura,” a region in the northeast of France known for its mountains, mountain cheeses, and wines. The wines of the Jura aren’t widely poured outside of France. But even in France, the waiter might hesitate if you order a glass since the flavor of them is very particular. The wines have a slightly maderized taste, almost oxidized, and reminiscent of sherry. Most people don’t expect that in a glass of vin blanc but the wines go extremely well with Comté, Bleu de Gex, Mont d’Or, and Morbier (which is the only one of them that I don’t love), the cheeses of the region, as well as cream-based dishes, but can be a tougher sell on its own. Vin jaune is another wine from the area that’s best enjoyed with foods of the region. The wine is fermented in oak casks for six years, giving it a partially peculiar oxidized flavor. It’s a tough sell by the glass or bottle, but terrific when swirled into a creamy sauce or served with cheese. 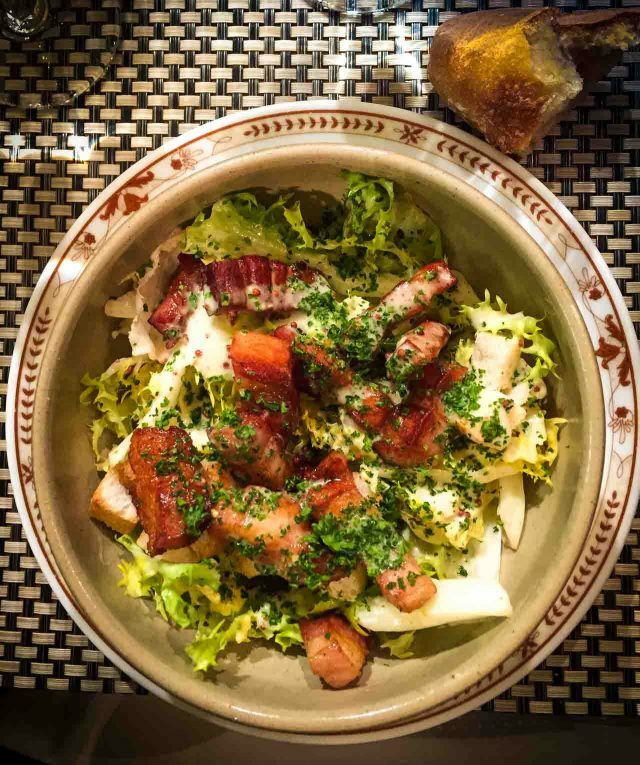 I knew I was in for a rich meal at Moissonnier so started with a salad, a classic Frisée aux lardons, served in a tight bowl with an appropriately correct mustard dressing and big chunks of semi-crisp bacon. It’s one of my favorite salads in the world and this was a textbook example of the classic. Although, to be honest, I went in knowing that it wasn’t going to be exactly a “light” salad. I was glad it wasn’t huge because of what was to follow. It was huge, which my friend eating it said repeatedly, and no one was arguing with him. While he kept offering tastes to everyone at our table, insisting he wouldn’t be able to finish it, somehow, he did. In keeping with my “light” idea for dinner, I wanted the scallops with leeks fondue (meltingly soft leeks), someone else at the table scooped up the last order from the specials board, which was okay with me because it gave me permission to order the Chicken with morel mushrooms and vin jaune. Creamy and rich, the chicken was served with egg noodles and I was glad it was just a cuisse (thigh), because if it had been a half a chicken, I wouldn’t have been able to finish it. (Well, I probably could have…) My guess is that this is the dish to get here, especially when morels are in season. Others at the table had monkfish with shellfish sauce (above), and roasted lamb chops persillé, below. The desserts were a bit mixed. I took a bite of my friend’s chocolate mousse flavored with orange and have to admit that I’m biased and don’t adore chocolate with citrus, or raspberries, which detract from the chocolate flavor. Just give me the chocolate, thanks. And that was the case here. The entrement citrus had me wondering if fresh lemon juice were used in the individual cake, as I missed that unmistakable and refreshing zing you get from freshly squeezed lemons, especially after a generously rich meal. 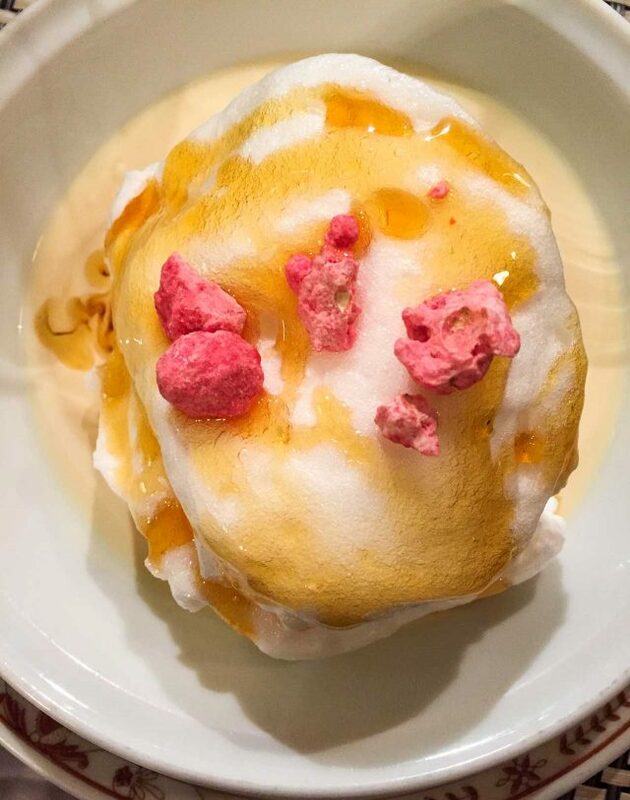 I am a big fan of Œufs à la neige and while mine was fine (shown at the top of the post), part of me was very full from the creamy chicken but part of me wanted a little more légerité (lightness) to the meringue. I didn’t take a taste of my friend’s meringues glacées which I’m sure was good (it was the one the people behind us were going nuts over), but I couldn’t manage even a bite, and let him enjoy it all by himself. You won’t find bearded hipster/bobo dudes or les jeunes filles clutching mobile phones and hopping up from the table between every course to go outside for a smoke at Moissonnier. The night we went, it was a pretty staid evening, with two French grandparents with their grandson, sighing with pleasure over their ice cream meringue,) and a few other couples getting respite from the chill of winter courtesy of the hearty cuisine from the Jura. But by the end of the evening, everyone seemed to leave happy – and full, including us. I just love those classic places. Had dinner here the last time we were in Paris. 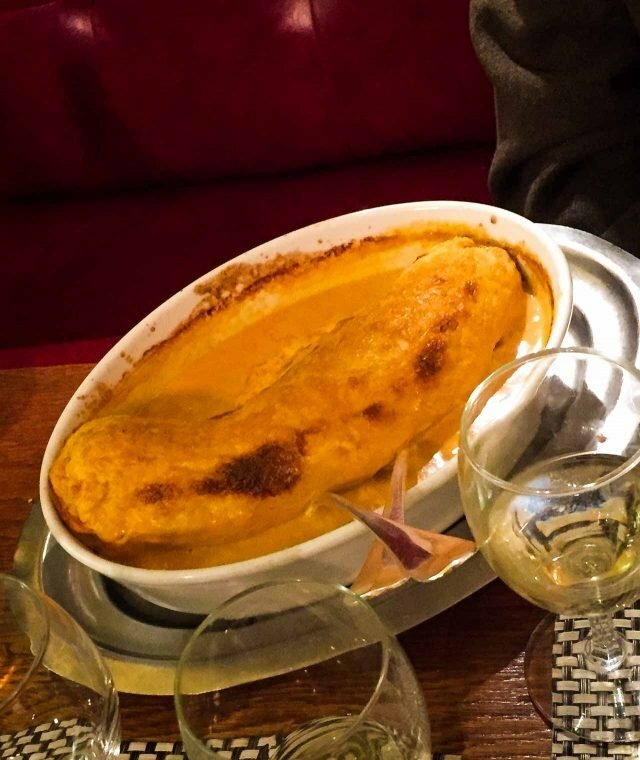 I had the quenelle and it went on forever! 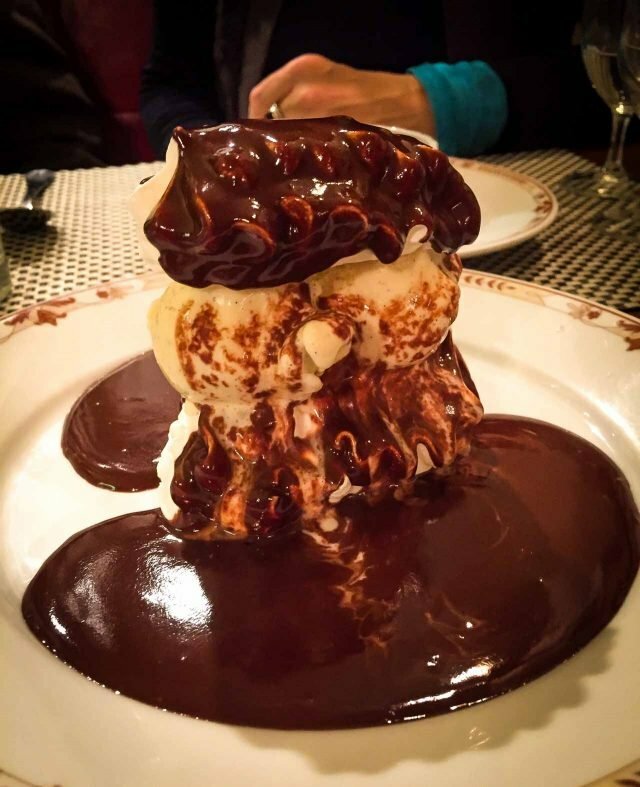 My husband had the chocolate meringue glacées and it was fabulous. My friend was overwhelmed by the size of it. I like quenelles but was formidable, for sure. Bravo for getting through it! I love your books & your blog. I cannot wait to get back to Paris and visit this lovely bistro. It is on my list. Dear David – I love reading your posts. We just got home from Paris on Monday; reading this means we need to turn around and go right back! Thanks for the delicious review. 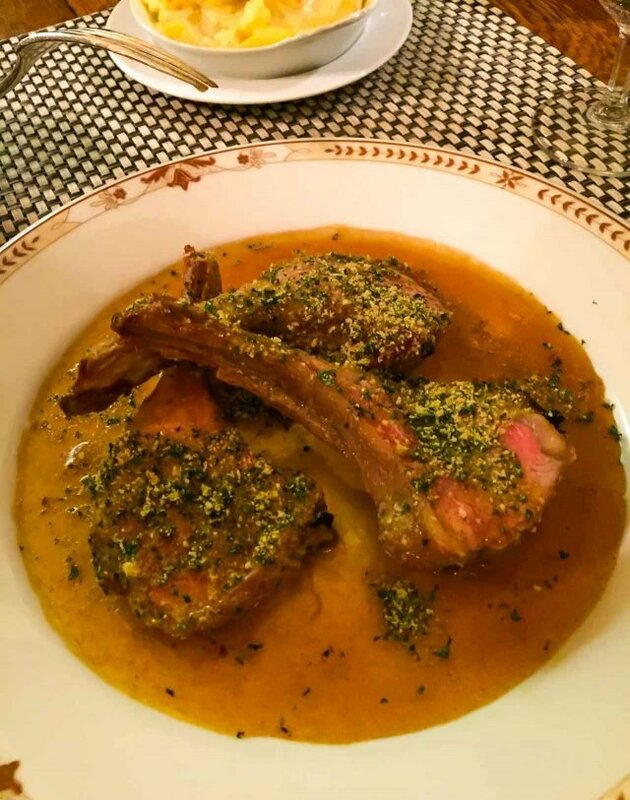 Mon dieu – my favorite kind of French restaurant. Your photos made my mouth water. Wish I were there – will definitely put this place on the “must” list for my next trip to Paris. The frisee salad and meringue glacees would be all that fit in my stomach. I’m with you when it comes to chocolate and citrus! Ahhh, love this place!! Thanks for the memories. Old school indeed. You really take us there. And I’m hungry. I like this kind of food–we tend to cook a simplified, somewhat lighter version of it at home. At a restaurant, it generally means you’re going to get what you want, and not some deconstructed surprise that isn’t at all what you imagined. That’s OK when the surprise is good, but sometimes it isn’t what you would have wanted. If I can reply to Christine about “pots” of wine (and not pots-de-vin!) as far as I know it is a measurement peculiar to Lyon and served in a sort of bottle, well, a pot! Sorry David, but I love Morbier!!! I’ll eat your share any time! 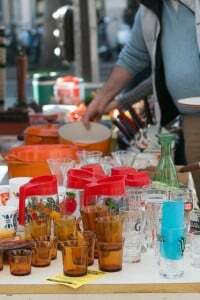 The mouthwatering pictures, exquisite- sounding French terms (love the sound of “bobo dudes…”) and most of all the detailed information about memory-making eateries on your blog makes me want to dream of being in Paris some day. I went to school in England but never had a chance to visit Paris. Every time I read your awesome posts, Paris calls my name. Terima Kasih, David (That’s “Thank You,” David in Malay). are there recipes I can look up somewhere for that dish and the chicken dish? The orange is the row part of the scallop. They are often served without. I have passed this place too many times and wondered. Its time to try it. Gorgeous looking food. Beautiful. Thank you for providing grace and beauty to the world with your blog. I check it every day so that I can be reminded of how things are supposed to be. Thank you. 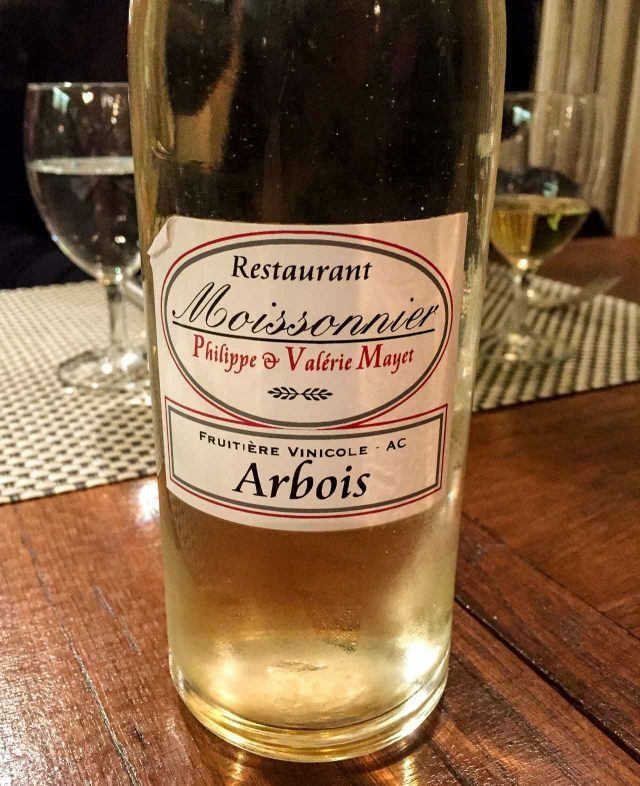 Your meal at Moissonnier is what I remember done in the many exquisite bistros located on the left bank of Paris in the 80′ and 90’s. Many are no longer as the younger generation found other professions other than over a hot stove. These are the comfort foods done with perfection not just in France but in other countries where cold weather exists. I too don’t want any fruit engaged with chocolate…just give me the pure chocolate please. Lovely review and photographs as only you do so well. 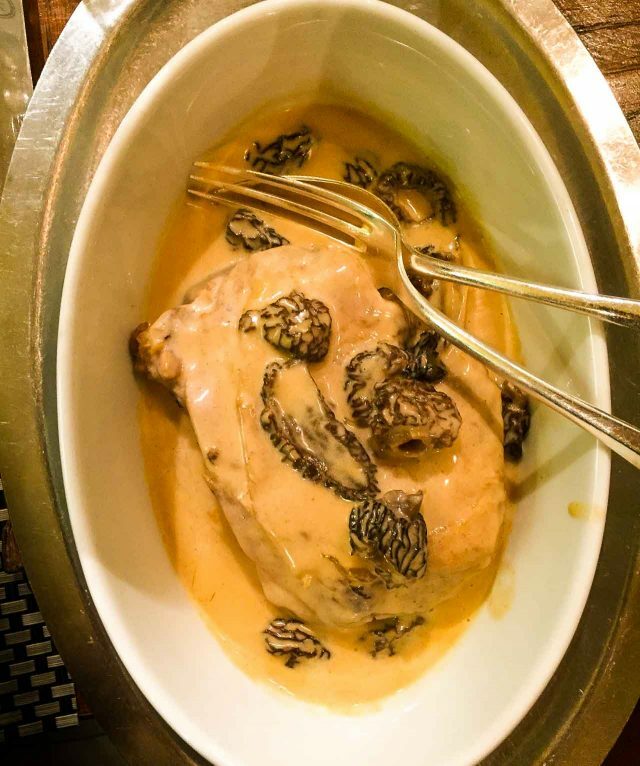 I want to take a bath in that chicken and morel dish. With the frisee salad on the side of course. The food looks perfect for a cold winters night. I’m with you; I don’t like sharing my dinner with everyone either unless it’s just moi and hubby. But I do like a little orange or lemon added to chocolate sometimes as it becomes it’s own unique flavor….like vanilla and orange make creamsicle. Gorgeous post, David, one of your best! I cannot wait to finish learning my French and booking that trip next year. Very sharp photos of the food, you can almost smell (taste) it!.. Lovely..
I’m laughing hysterically at the last dessert, which would serve a family of four–so much for the idea of small portions in Paris! Everything you’ve photographed reminds me of my first fine dining experience in Paris in the 70’s: the food was good but unappetizing looking, with very little color contrast. I’m sure your dinner was good, but I also understand why nouvelle cuisine came into style. Jura fanatics here, and knew nothing of Moissonier but will clearly be reserving for our upcoming April visit. We live for Comte and coq au vin jaune! On my list for my next trip to Paris. This is precisely the sort of place I am always looking for in Paris, and have great difficulty finding. 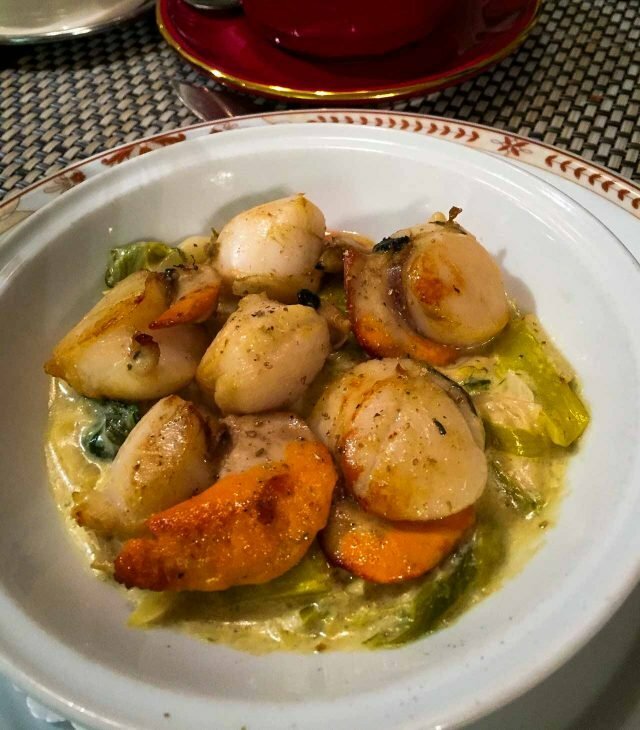 I cannot get well executed classic French food where I live, while the more modern French style cooking is easy to find here as it is in Paris. Thanks so much for the post. This must be one of the ‘hidden secrets’ to have survived in the competitive Parisian food scene for so long, yet when you google the restaurant name, the very second entry is this very blog post! I will have to earmark this place for our next trip to Paris. 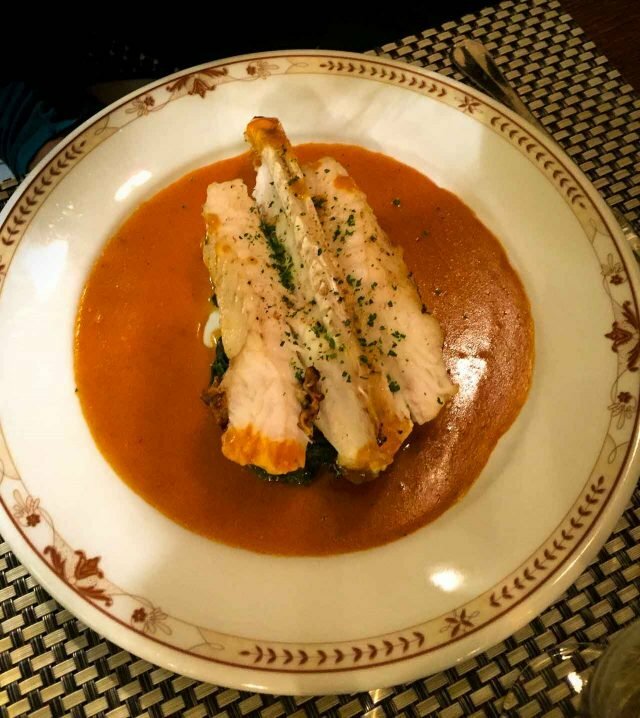 On our recent trip we had splendid meals at La Regalade 14eme and La Bourse et la Vie (which I discovered via this blog). I’d give La Bourse the edge on the quality but enjoyed the atmosphere more at La Regalade and especially their homemade pates. And I’m always on the hunt for bistros of similar quality to try out. No better wine for basting a chicken or turkey, it’s a Jura all the way. Try a ‘traditional’ if the Savignan is too scary. It does sound like very nicely rendered, perfectly classic French food. I’d love to go back to Paris soon and eat at a properly classic bistro – will add this to the list. Thank you! Praline rose on Œufs à la neige sounds like a great mixture of textures. Have you ever tried to make praline rose? I have-with very mixed results-and would be very interested if you could produce a recipe for them. I’ve made quite of few pralines like that (my recipe for pralined almonds is in The Perfect Scoop, pg 196). I don’t typically add red colorant to mine, but my take is that a few drops in the mixture would give them that rose color, although I’m not 100% sure since I haven’t tried it. It’s very tricky. Adding food coloring (liquid) seems to do terrible things to the caramel. Unsurprising, I suppose, because it must alter the chemistry. Powdered food coloring produces a pink but translucent praline. Still a long way from praline rose. I’d love to know how to get it right because buying it is eye-wateringly expensive. I’m not sure how you’d make them without using colorant, but here are two French recipe blogs that show how to make them: Pralines roses maison en 5 minutes and Pralines roses. Brilliant. Thanks for that. Reading them I think I was not cooking the praline long enough. So simple. Doh. Will be visiting Paris in late March and this restaurant is on our list. 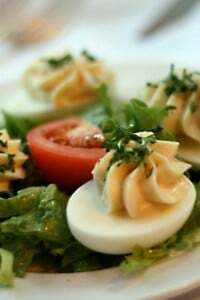 It’s one of my favorite salads and my recipe for it is in My Paris Kitchen. Oh thank you! I have your book at home in my kitchen!! I’m with you David, I order what I want and do not wish to share OR try anyone else’s! Back in the 80, Moissonnier was considered one of the top bistros in town – full upstairs and down every night. Then it seemed to slip below the radar. Glad to hear that it’s holding up so well.